This is PLC program for an artificial fishpond water level monitoring system. 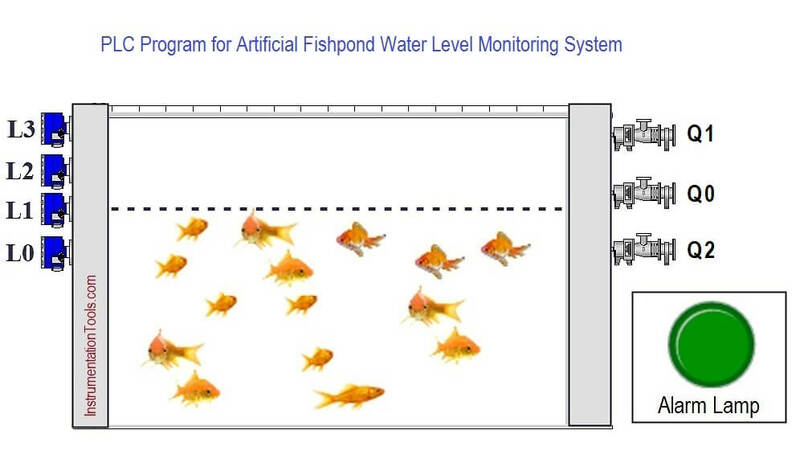 Implement PLC program for an artificial fishpond water level monitoring system. Feed or drain the water of artificial fishpond when water level is below the normal level and activate the alarm when water level is above or below the level. This problem can be solved by using simple automation. Here we considered one artificial fishpond, four level sensors and three pumps for system monitor & control. Here we will write program that will control whole system. System will maintain normal level and it does not allow water level to go up or down to maintain the normal level. If water level goes down from the normal level then system will feed water in the fishpond and if water level goes up from the normal level then system will drain water from the fishpond. Level Sensor, L0 : I0.0 (L0=1 when the water level is above the alarm level). In this problem we will consider S7-300 PLC and TIA portal software for programming. In this network, we have written logic for drainage pump 1 (Q0.1). When water level is above the highest level of alarm level (L3 = I0.3), at that time drainage pump 1 (Q0.1) will be ON. If water level is below the alarm level then feeding pump (Q0.0) should be start. So here we have taken NC contact of L1 (I0.1), when level is below the normal level then feeding pump (Q0.0) will ON and fill the water in the fishpond. If water level is above the normal level then the drainage pump 2 (Q0.2) will be ON. Here water level is above than the normal level, not alarm level, so only drainage pump2 (Q0.1) will work. Here we have used two conditions in OR gate so either level is below normal level (L1 = I0.1) or above normal level (L1 = I0.1) then flashing circuit will be activated and alarm lamp (Q0.3) will be ON. Timer 2 for flashing circuit. Here we have used two conditions in OR gate so either level is below normal level (L1=01) or above normal level then alarm lamp (Q0.3) will flash automatically on 5 second interval. Level is above alarm level (L0=1, L1=1, L2=1, L3=1) or below alarm level (L0=0, L1=0, L2=0, L3=0) THEN alarm lamp will flash automatically on 5 seconds interval. Level is above alarm level (L0=0, L1=0, L2=0, L3=0) then drainage pump 1&2 will start and if water level is above normal then only drainage pump 2 will start. Note:- Above example is for explanation purpose only, not all parameters or interlocks are considered. It is not necessary to use S7-300 PLC for this simple logic, we have used this PLC for our discussion purpose. Is Q0.1 a feed or drain pump? feed pump-this pump used to fill any tank. AS example boiler feed pump fill water in Boiler Drum for steam making process.Another simple example is-our home roof top water vessel or tank as motor start water feed (fill) in tank.